The Rookery Building, named for the previous building on the site that had become home to many birds, is built in the Loop in downtown Chicago. At 11 stories tall, it is not as tall as some of the pair's other designs. It does, however, utilize large windows to bring in light. These windows not only cover the outer walls, but also the roof, leading to an interior "Light Court". 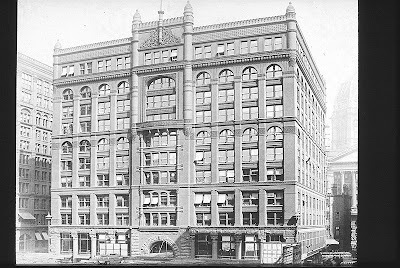 With The Rookery Building, Burnham and Root developed the technique of the floating foundation, especially necessary due to Chicago's unstable soil. They also integrated other developing techniques, such as the inner steel skeleton to support the building's height. In the early 1900s, Frank Lloyd Wright completed a rennovation on the interior of the building. He used techniques also seen in his Prairie Style homes, using lighter colored materials and adding additional light inside. The Rookery is the only building within the downtown area of the city that Wright worked on. It is considered the oldest standing high-rise within the city of Chicago, and one of Burnham and Root's greatest designs. They housed their offices once it was completed, using it as their workspace during their designing of the 1893 Columbian Exposition in Chicago.